This is Friday – ramp day is tomorrow, Saturday. Suzanne is bringing the trailer from Holyoke, Melissa and Richard are bringing their truck from Maine, Michele and Carolyn are coming from Plaistow, and AUKLET and I are coming from across the little river. Earlier today the two guys from the boatyard came to help with the masts. I had spent yesterday getting them all detached, halyards tied, etc., and Suzanne was here on Wednesday taking the second anchor and its crate out of the bow well, and the bolt out of the tabernacle and main mast, and all sorts of Stuff off the boat. It feels like such a job, getting the rigging all taken apart, but it’s pretty much done now, and most everything is horizontal on top of the cabin. Tomorrow will be four months and three days since we launched in early June. 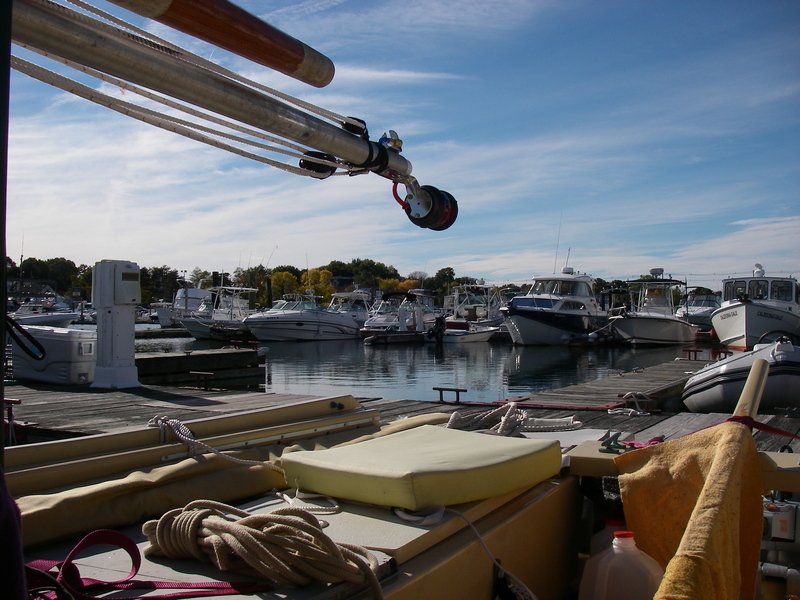 Some of my primary goals worked out: overnight passages, sailing downEast, outfitting and supplying the boat for being off for many weeks at a time without shore support visits and resupply. Gear was tested, and found to be good: the leecloth, the AIS, and all those new gaskets. And I had marvelous visits with friends, old and new, and with family, and with WHALES! Who could ask for more!